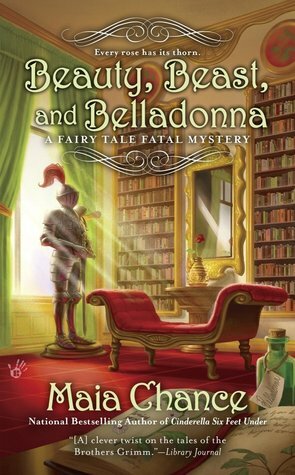 Beauty, Beast, and Belladonna is the 3rd book in the Fairy Tale Fatal series, set in 1867. I love cozies and historical fiction, and this story was a wonderful mix of the two. Variety hall actress Ophelia Flax finds herself at a hunting party in France, pretending to be someone she is not, and trying to figure out how to avoid getting herself married to the Compte de Griffe. When an unexpected guest turns up dead after a string of petty thefts, she must try to find both the thief and the killer to get herself out of more than one entanglement. I absolutely loved the colorful characters, the time period, and the setting in this story. I plan on going back soon to read this series from the start! 1. Describe Beauty, Beast, and Belladonna in 140 characters or less. Beauty, Beast, and Belladonna is a fun, adventurous, and romantic historical mystery set in a secret-riddled French chateau in 1867. 2.) What is your idea of perfect happiness? Happiness for me is spending time outside somewhere beautiful, with my husband, kids, and dog. 3.) What’s your favorite part of Ophelia’s quirky personality? I like the way Ophelia compensates in creative and gutsy ways for her lack of a good formal education. She’s smart and resourceful and she uses her unusual skill set—farm girl, circus performer, actress—to help solve the mystery. 4.) Which living person do you most admire? My husband, actually. He is an unusually gifted person who overcame significant disadvantages and obstacles to get where he is today. And he gives the best pep-talks! 5.) What inspired you to marry fairytales and mystery? I was searching for something that hadn’t been done yet, and I was reading a lot of fairy tale criticism for school at the time. It sounded like a deliciously fun project, so I plunged in. 6.) Is there a type of scene that’s harder for you to write than others? Love? Action? Racy? 7.) What do you consider the most overrated virtue? Sticking to strict schedules. I don’t like to keep people waiting, but there is something to be said for giving yourself creative or restful wiggle-room during the day. 8.) Which of the characters in this novel do you feel the most drawn to? I became more attached to Professor Penrose in this book. He’s more vulnerable and at a loss than in the previous two books—and more deeply in love. 9.) Which words or phrases do you most overuse? Oh, my. Probably dozens. I seem to like “buzz” a lot for some reason. I’m deleting it all the time. 10.) Can you describe for us your process for naming characters? For historical American characters I use census records. I collect names from cemeteries whenever I visit one, and I often borrow names from literature. Since my books have lots of characters, I try to give them all distinctive names that hint at their personalities, to help the reader keep everyone sorted in their mind. 11.) Who are your favorite writers? Agatha Christie, P.G. Wodehouse, Edith Wharton and Theodor Adorno. 12.) Who is your most loved hero of fiction? 13.) Which talent would you most like to have? It would be ecstasy to be a really, really great opera singer. 14.) You’re hosting a dinner party, which five authors (dead or alive) would you invite? P.G. Wodehouse would probably be the life of any party. Also, Agatha Christie, Edgar Allan Poe, Shakespeare, and F. Scott Fitzgerald. There would be lots of drinking at this party. Maybe some arguments. No strip poker though. 15.) Do you have a favorite time period in literature? Not really. Because of my English degrees I have read very widely, and I have favorites from every era. And every era has its stultifying boring authors, too. 16.) What is your motto? 17.) What is the best reaction over a book that you’ve ever gotten from a fan? Fans who say my book gave them pure pleasure—that’s happened a few times—make me so happy. It’s my aim to give people something to read that’s a pleasurable and absorbing diversion from Real Life. Real Life is hard. 18.) Where would you most like to live? A place with lots of trees where I could do all my daily activities and errands on foot. I’m working on it. 19.) Which historical figure do you most identify with? No one specific, but I often think of the female writers over the centuries who kept at their stories even when they had screaming kids and the dinner to cook and a really messy house piling up around them. They did it, and so can I. 20.) What are you working on next? I just completed a humorous contemporary mystery that does not yet have a publisher, and I’m working on a historical fantasy adventure with a co-author. After that, the next thing will be book #3 of the Discreet Retrieval Agency series. “What’s this?” Ophelia had almost stepped on something at the base of the cave wall. Small earthenware dishes held what appeared to be chocolate drops, purple berries, and loose pearls. A clay vase held a red and white striped rose. Churches in New England didn’t have shrines. They didn’t even have stained glass windows or statues. “Pearls,” Ophelia said. “Madame Dieudonné was missing a pearl necklace.” But—she looked carefully at the shrine—no ruby ring. Still, the pearls connected the shrine, very loosely, to the missing ring. There was hope yet. “This resembles the offerings people of the Orient assemble for their gods or ancestors,” Penrose said. “Those are belladonna berries, professor.” The skin of Ophelia’s back felt all itchy and crawly, and she stole a glance to the black gap where the cave continued into the earth. Someone could be back there. Watching. “Miss Flax,” Penrose said slowly. “Look at this.” He lifted the lantern, illuminating the picture on the wall above the shrine. Heavens to Betsy. A carved, black-painted beast, half-man, half-boar, undulated in the light. The body of the beast was like a man’s, although the feet seemed—Gabriel squinted—yes, they seemed to have hooves. But the head! It was unmistakably that of a furry boar, with large pointed tusks and tiny round ears. A slight crunching sound made Gabriel and Miss Flax freeze. Their eyes met. Gabriel knew that somewhere in the shadows, someone or something lay in wait. Miss Flax, wide-eyed, in those awful trousers, seemed at once horribly vulnerable and dear beyond measure. The pistol tucked into Gabriel waistband felt newly heavy. He picked up the lantern and slowly stood, willing himself not to exude the essence of fear in case whatever was watching was an animal. She stayed very close to him as they walked steadily out of the cave. They emerged into the cold, damp night. The moon glowed whitely above. The air tasted of soil and rot. “Shouldn’t you extinguish the lamp?” Miss Flax whispered as they started down the rocky, ice-slicked slope. “So they can’t see us?” She tugged her wrist free of his hand so she could climb. Ophelia meant to cling to her purpose like a barnacle to a rock. It wasn’t easy. Simply gritting her teeth and enduring the next two weeks was not really her way. But Henrietta had her up a stump. First, there had been the two-day flurry of activity in Artemis Stunt’s apartment, getting a wardrobe ready for Ophelia to play the part of a fashionable heiress at a hunting party. Artemis was over fifty years of age but, luckily, a bohemian and so with youthful tastes in clothing. She was also tall, beanstalkish and large-footed, just like Ophelia, and very enthusiastic about the entire deception. “It would make a marvelous novelette, I think,” she said to Ophelia. But this was exactly what Ophelia wished to avoid: behaving like a ninny in a novelette. And now, this interminable journey. “You said you missed the country air.” Henrietta shoved his boots off the seat. “Did I?” Forthwith had now and then performed conjuring tricks in Howard DeLuxe’s Varieties back in New York, so Ophelia knew more of him than she cared to. He was dark-haired, too handsome, and skilled at making things disappear. Especially money. Ophelia sighed. Oh, for a couple wads of cotton wool to stop up her ears. Henrietta and Forthwith had been bickering for the entire journey, first in the train compartment between Paris and Limoges and then, since there wasn’t a train station within 50 miles of Château Vézère, in this bone-rattling coach. Outside, hills, hills, and more hills. Bare, scrubby trees and meandering vineyards. Farmhouses of sulpherous yellow stone. A tiny orange sun sank over a murky river. Each time a draft swept through the coach, Ophelia tasted the minerals that foretold snow. “Ophelia,” Forthwith said, nudging her. Forthwith made series of fluid motions with his hands, and a green and yellow parakeet fluttered out of his cuff and landed on his finger. “It hasn’t got feelings, silly.” Forthwith yawned. The coach passed through ornate gates. Naked trees cast shadows across a long avenue. They clattered to a stop before the huge front door. Château Vézère was three stories, rectangular, and built of yellow stone, with six chimneys, white-painted shutters, and dozens of tall, glimmering windows. Bare black vegetation encroached on either side, and Ophelia saw some smaller stone buildings to the side. “Looks like a costly doll’s house,” Henrietta said. “I rather thought it looked like a mental asylum,” Forthwith said. Ophelia slid Griffe’s ruby ring on her hand, the hand that wasn’t holding a parakeet. Someone swung the coach door open. “Let the show begin, darlings,” Henrietta murmured. “Sister?” Griffe knit his brow. “Mrs. Henrietta Brighton,” Henrietta said quickly, and then gave a sad smile. Precisely when had Miss Henrietta Bright become Mrs. Henrietta Brighton? And . . . oh, merciful heavens. How could Ophelia have been so blind? Henrietta was in black. All in black. “Did Miss Stonewall neglect to mention that I would chaperone her on this visit?” Henrietta asked Griffe. “I am a dear friend of the Stonewall family, and I have been on a Grand Tour in order to take my mind away from my poor darling—darling . . . oh.” She dabbed her eyes with a hankie. Ophelia and Forthwith followed. The parakeet’s feet clung to Ophelia’s finger, and tiny snowflakes fell from the darkening sky. “You’re shameless,” Ophelia said to Forthwith in a hot whisper. Thanks for the excerpt and interview! I learned more about Maia and enjoyed the first ones in this series. Glad to hear it – I have to go back and read them! Ooo, a marriage of fairy tale and mystery seems really interesting, and the excerpt is good. I’m quite enamored with historical fiction lately. #18-I want to live there, too!